Cellfood SAM-e brings a major breakthrough in nutritional chemistry: a liquid SAM-e formula combining S-adenosyl methionine with the nutrients and unparalleled delivery system of Cellfood. The result is a unique nutritional supplement providing benefits for multiple needs. SAM-e is a supplement that is not only being used successfully around the world, but also has a substantial— and growing— base of research behind it. What’s special about Cellfood SAM-e? Cellfood SAM-e is the only liquid SAM-e in the world — formulated in a stabilized form that may provide as much as a 95% absorption rate, as compared to tablet and powder forms with much lower absorption rates. Thus, the daily dosage 72 mg of SAM-e provided in this formula — along with Cellfood as the optimum delivery system — may give this formula an effectiveness equivalent to dosages of up to 400 mg per day. And, for those requiring smaller dosages, there’s no need to break tablets in order to receive the perfect dosage. Simply take fewer drops as desired. SAM-e supports sulfate groups’ absorption into glycoproteins, which help maintain cartilage and protect joints. Cysteine and glutathione are byproducts of this absorption process and have potent health-optimizing properties. 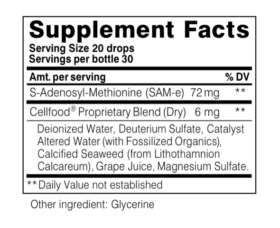 Cellfood SAM-e functions by donating its methyl group to CNS receptors which increases the activity and production of the mood-boosting neurotransmitters serotonin, dopamine, and norepinephrine. In the liver, Cellfood SAM-e supports GSH production and uptake, which is mainly responsible for removing dangerous toxins from the body. Because of the liver’s continuous battle against toxins, adequate concentrations of glutathione are crucial to survival. Damage occurs when the liver is so overwhelmed by toxins that it cannot produce enough glutathione. SAM-e is a necessary component of glutathione’s creation. Take ten (10) drops directly in the mouth and swallow, two (2) times per day. No refrigeration required. Cellfood SAM-e Liquid Formula+ comes in a 1- ounce bottle that provides a 30-day supply when taken as directed. is the only liquid SAM-e in the world, and features Cellfood’s unique delivery system.